In the wake of the successful overhaul of its skipper training program, the VH maritime school rolls out the next phase in the internationalization of its main programs — integrating relevant seafaring experience with marine engineering. Following a series of upgrades in its simulation equipment, the Faroe Islands’ foremost maritime school, Vinnuháskúlin (VH), continues the modernization of its core training programs with Marine Engineering currently undergoing adjustments to align with contemporary international standards. An equivalent alignment of the Skipper program has been followed through since 2015, reducing the amount of required seafaring experience while at the same time making it more specific to the actual training. Whereas Skipper training earlier involved a minimum 36 months of unspecified seafaring experience, it now requires 12 months of seafaring coordinated closely and specifically with the training program. As for Marine Engineering, seafaring experience was earlier not a requirement; however, with the adjusted program six months of course-relevant seafaring will be an integral part of the training. As of the beginning of the 2017/2018 academic year in August, the VH’s Marine Engineering program will be based fully on the official Danish curriculum, adding seafaring experience to the training itself. The streamlining of VH’s training programs is seen as an extension of the overall modernization that has taken place since Wilhelm E. Petersen took the helm, in particular with regard to the increased use of simulation technology. The school has become extraordinarily well-equipped with state-of-the-art technology used for simulation for training purposes, as related to, for example, navigation and bridge operations, engine room control and supervision, or emergency management. The VH has thus become one of the best-equipped maritime academies in the entire Nordic Seas region, according to the managing director. Mr. Petersen wanted to modernize the school and decided early in the process to make all courses fully compliant with international conventions and protocols, with the main training programs designed in accordance with Denmark’s maritime education system. VH has received overwhelmingly positive reactions in response to the adjustments made in the training programs, Mr. Petersen noted. “We have had very positive feedback from people and it’s clear from the number of admission applications received that our programs are respected and popular. This is not surprising, however, as the education we provide is rock solid and the training environment is second to none. 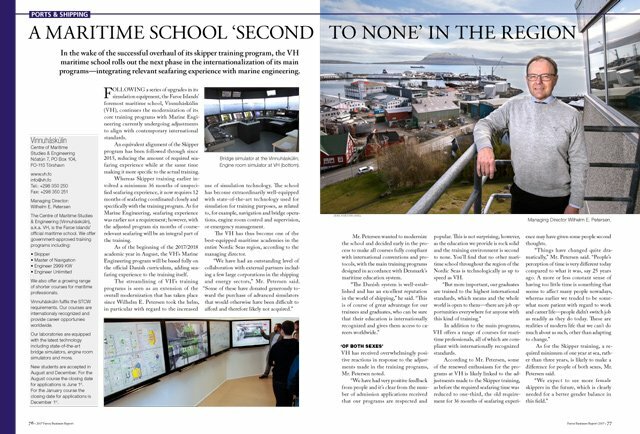 You’ll find that no other maritime school throughout the region of the Nordic Seas is technologically as up to speed as VH. In addition to the main programs, VH offers a range of courses for maritime professionals, all of which are compliant with internationally recognized standards. According to Mr. Petersen, some of the renewed enthusiasm for the programs at VH is likely linked to the adjustments made to the Skipper training, as before the required seafaring time was reduced to one-third, the old requirement for 36 months of seafaring experience may have given some people second thoughts. As for the Skipper training, a required minimum of one year at sea, rather than three years, is likely to make a difference for people of both sexes, Mr. Petersen said.